"It's beginning to look alot like Christmas." School's officially out until Jan 4th. It's starting to feel more and more like Christmas every day. I debated whether or not to go to the kid's "winter parties" (as they now call them). After a few minutes deliberating I decided to go. Little Man's class was more of a "let's eat junk food and hang out" thing. Pokey's was more structured and it turned out that they needed my help. I ended up staying in her class for the duration. Her teacher is more of a germ freak than I am, so she wanted me to stand at the table and distribute the goods to each child to prevent any cross contamination so to speak. While I was handing out treats Pokey pulled up a chair and sat down right next to me. It was a priceless moment. I knew that she was glad I was there. There's not really much to take photos of, so towards the end I took a picture of Pokey with some of her friends. Cause let's face it, without friends it wouldn't be much of a party. 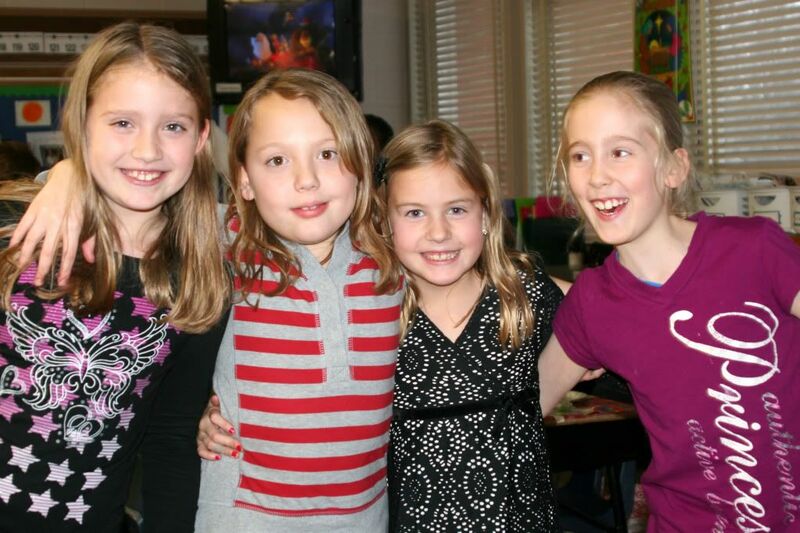 It's just a small school and these are girls she's been with since Kindergarten. I've noticed that as they get older they are bonding more. I curled Pokey's hair with my spiral iron this morning. It was so cute. Unfortunately it didn't fair well as evident in the photo. I also wanted to note that I bought the cutest little Christmas top for her, but when she went to put it on it was too small. She picked out the black dress. Maybe a little dressy for the occasion, but she was excited to wear it. Oh, the reindeer cupcakes were a hit. Unlike the spider legs, the kids enjoyed all of it, even the mint eyes (for wedding favor bags I think). They especially liked the chocolate antlers. Almost everyone thought they were pretzels, so it was a fun surprise. Only 1 left over. Pokey saved it for Dad. They are forecasting some freezing rain tonight, possibly an ice storm. I also heard the snow originally forecasted for Thursday has now been downgraded to rain so they are warning of possible flooding. And we might get snow on Christmas. Sounds like fun driving conditions. Glad we have nowhere to go. We're headed out to stock up on food and movies.